Season 7 of Game of Thrones ended 5 days before I found out I was pregnant with our second son who is turning 1 in a month. THAT’S HOW LONG IT’S BEEN, GUYS. That’s absurd! We’ve waited so long! And since it’s finally here, we’re celebrating in major cookie style, with a side of more celebrating, because around these parts, FAF is seeing a major milestone at the end of this week. This coming Saturday, the 13th, Fresh April Flours turns the big 5. FIVE. YEARS. of blogging. FIVE years of recipes. FIVE years of cakes, cookies, breads, biscotti, cupcakes, and NO shortage of SPRINKLES. If you follow me on Insta or Facebook, you know that this week is FUNFETTI week (#faffunfettiweek). 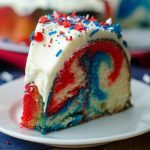 I’m sharing some of my favorite recipes from the archives that involve the most sprinkles any one person can round up in one baked good and bringing light to the fact that this week is a dang celebration of all the exciting things this week has to offer. 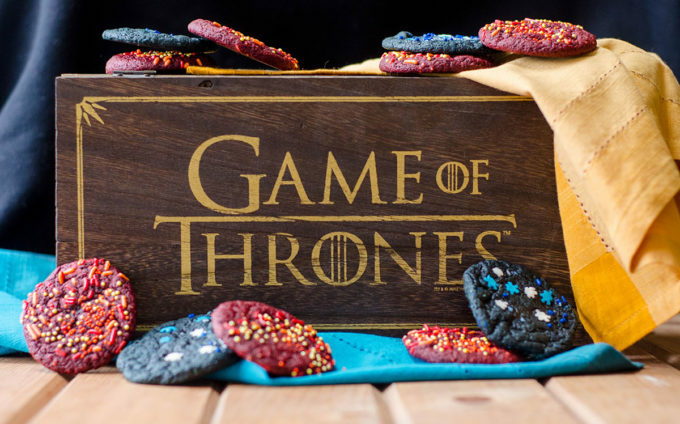 So why not combine the anticipation of Game of Thrones coming back for one last hurrah with a little blogiversary with these ice & fire cookies? It seems like the perfect fit. 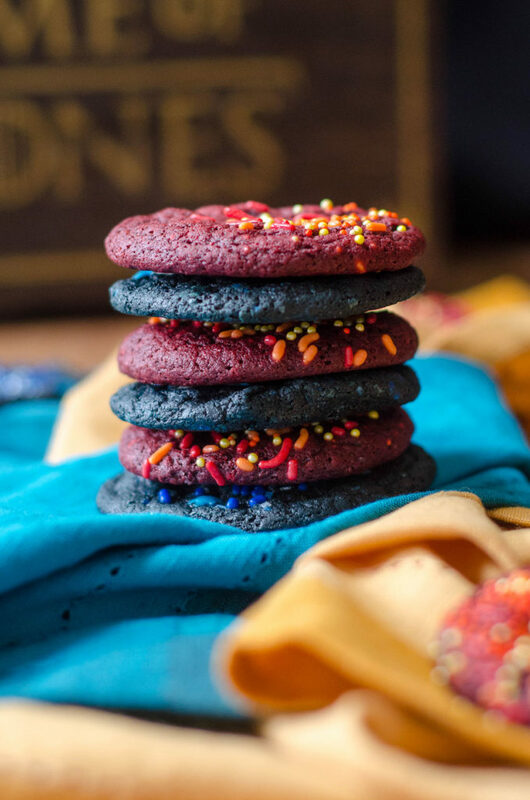 Oh, and don’t forget to come back on Saturday, FAF’s actual blogiversary date, for a special funfetti recipe combined with a SWEET giveaway from one of my favorite brands: Rodelle. 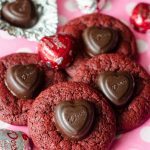 They always deliver an incredible goodie box of baking ingredients to winners of my giveaways, so you won’t want to miss a chance to be that lucky winner! As happens often here, this is a recipe you’ve seen before. 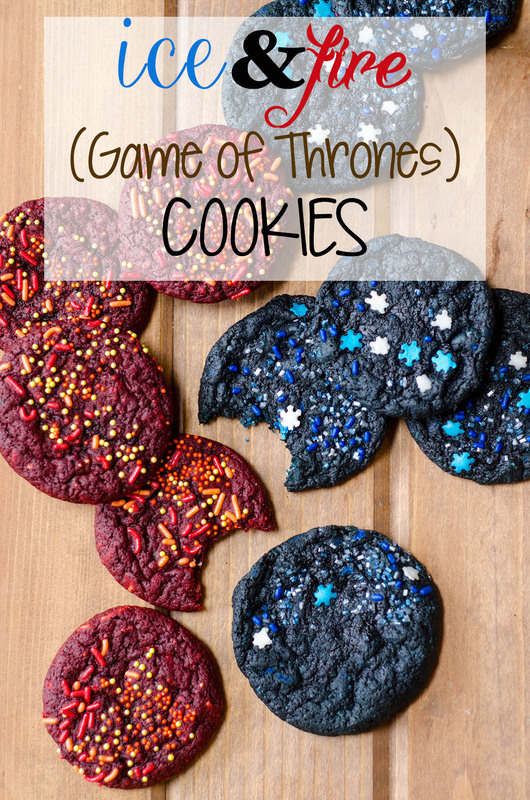 I made red velvet blossoms and crinkles longggg ago in 2015, and knew that since those cookies were such a hit, they were the perfect foundation for what I wanted to do with celebratory Game of Thrones cookies. 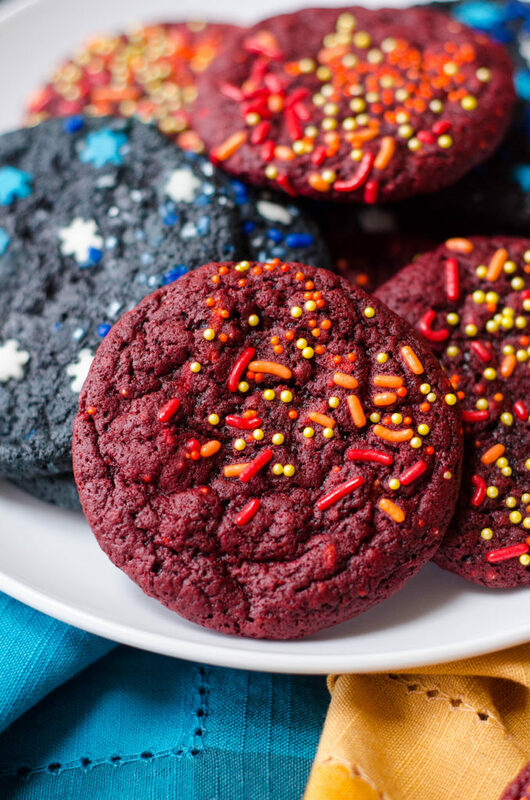 Similarly to replacing the red coloring with black coloring for my black velvet layer cake, so did I replace the red coloring with blue for the ICE cookies in this duo. The swap was perfect! 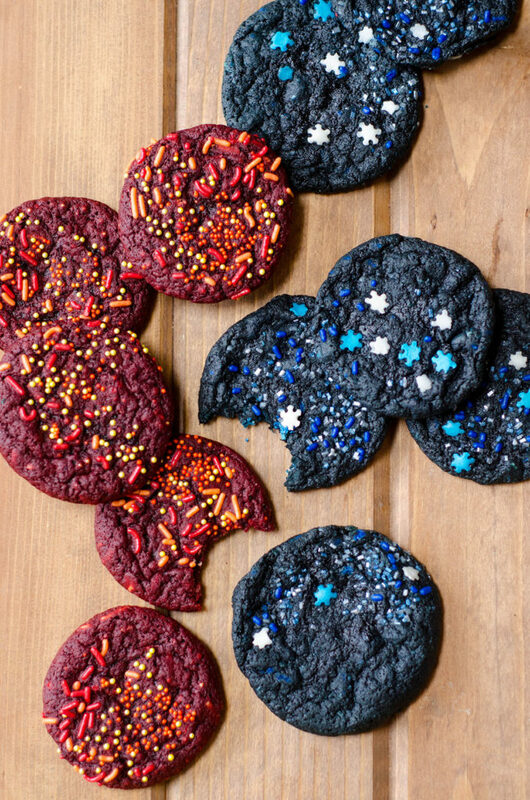 To add another touch to these cookies, I added sprinkles. And I wish I could tell you that I found “ice” and “fire” sprinkle blends, but I really just mixed a bunch of rods, beads, and shapes together to make the blends I wanted. A 1/4 cup of sprinkles goes into the cookie dough, and another 1/4 cup is reserved for dipping the tops of the cookies into. A collection of sprinkles on the top of a mound of cookie dough makes for a splattered sprinkle collection on the baked cookie. 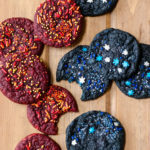 It’s a super cute touch to any cookie, and it worked so nicely in these ice & fire cookies. Gave the perfect complementary visual touch! Plus… SPRINKLES make everything better and they add that little crunch factor. 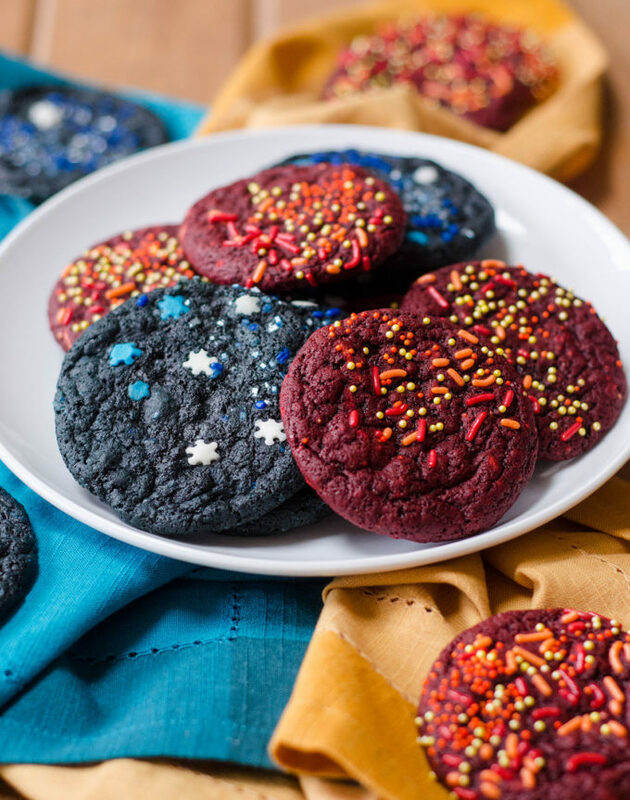 These cookies are FLAVORFUL. 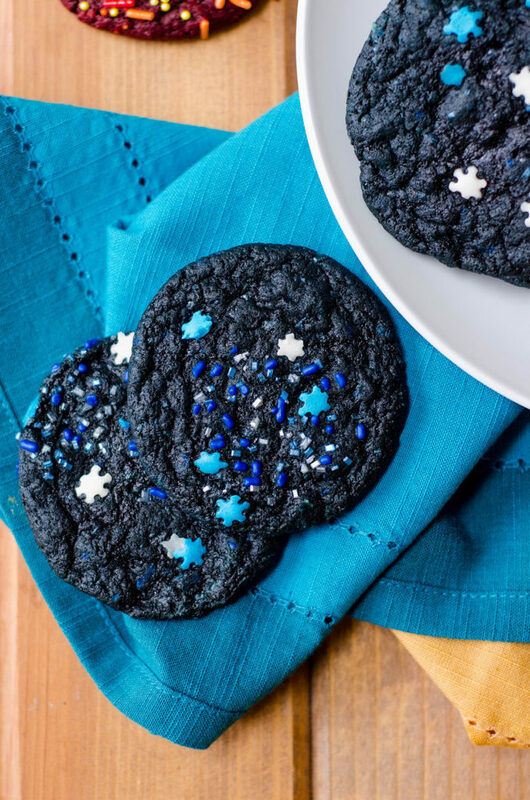 They’re packed with deep notes of chocolate without being a chocolate cookie, and the sweetness is just right. So feel free to decorate them however you want, if you’re not feeling up to sprinkles. Drizzle with white chocolate, dip into colored candy coating, whatever you think works best for your Game of Thrones celebration. Seriously, guys… It’s been SUUUUUUUCH a long time since we last saw Winterfell. We absolutely need cookies to celebrate, don’t we?? In a medium size bowl, toss together flour, baking soda, salt, and cocoa powder. Set aside. In a separate medium size bowl with a hand mixer or the bowl of a stand mixer fitted with the paddle attachment, cream butter and sugar until light and fluffy, approximately 3 minutes. Add the egg and beat again, scraping down the sides as necessary. Add vanilla and food coloring and beat on medium speed until combined. Using a spatula, scrape down the sides and all along the bottom of your bowl to ensure coloring is distributed evenly. Add 1/4 cup of the sprinkles and beat again on medium speed until everything is incorporated. Decrease mixer speed to low and add the flour mixture. Beat on low until dough has formed and no more pockets of flour remain. Cover bowl with plastic wrap or foil and refrigerate for at least 2 hours and up to 3 days. If chilling longer than 2 hours, allow dough to sit at room temperature for 30 minutes before rolling into balls. When you are ready to bake your cookies, preheat the oven to 350ºF and line a baking sheet with parchment paper or a silicone baking mat. Roll dough into balls approximately 1 Tablespoon in size. Dip the tops of the dough balls in remaining 1/4 cup of colored sprinkles, and place no more than 6 balls of dough on a baking sheet at a time. Refrigerate dough balls on baking sheet for 10 minutes. After chilling, bake cookies immediately for 10-11 minutes. Cookies will look underdone. Remove baking sheet from oven and allow to cool for 5 minutes. Remove cookies from baking sheet and allow to cool completely on a wire rack. Cookies can be stored in an airtight container at room temperature up to 7 days or frozen for up to 2 months. **Room temperature eggs are crucial for proper incorporation into batter. To bring eggs to room temperature quickly, place in a bowl of warm water for 10 minutes. **If using gel food coloring, use 1/2 Tablespoon.